The amount of hot water available varies by equipment size, temperature and application requirements. Heat exchangers are available in several configurations that offer very economical heat recovery options. Plate and frame heat exchangers are composed of multiple, thin, slightly separated plates that have very large surface areas and fluid flow passages for heat transfer. Shell and tube heat exchangers (below) consist of a series of tubes. These tubes contain the fluid that will be either heated or cooled. The second fluid is in the shell and is pumped around the tubes to absorb the heat and cooling the initial loop. 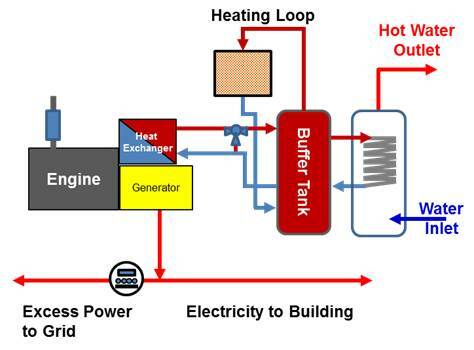 Waste heat recovery process systems have many benefits for CHP applications. The recovery process adds to the efficiency of the CHP system, can decrease the fuel and energy consumption needed for other applications (i.e. water or space conditioning). Integrated into a CHP system, heat recovery can provide space conditioning and hot water as well as power to the building.